Amethyst Construction Inc. owns and operates a recycling plant for crushing concrete and asphalt to produce graded material for base material on roads, parking lots and surfacing material for driveways. We crush material to your specifications and gradations. Our plant is mobile and we will come to your job site to crush the material or we will haul the uncrushed material to one of our crushing sites. 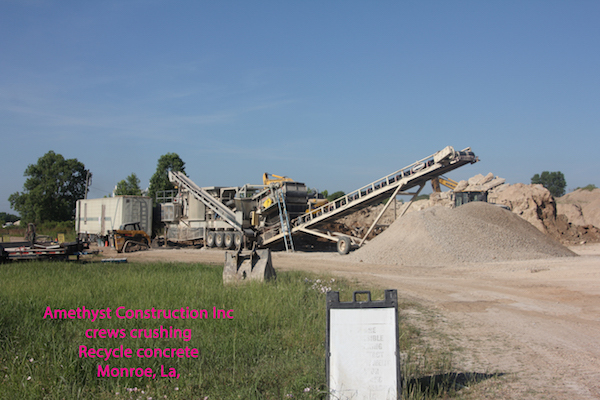 Our crushed material is approved for use on LA DOTD roadways and all municipal and parish projects. If you have concrete to dispose of, give us a call and we will furnish loading and hauling your material. We can also furnish bedding material for utility and drainage pipelines and produce various grades of rip rap for erosion control.